Well there’s been interesting responses to yesterday’s post – to say the least. First off, the traffic to the blog has taken off exponentially, with hundreds of new readers and subscribers (if that’s you – welcome, if you’d like to, click over there on the right!). I suppose it’s not my skilful prose but the subject matter that’s drawing attention from all over the world, it’s the question I posed yesterday which still stands about Lakeland – is it revival? Some people say yes. They look at people being healed, recognise that were there’s a lot of Spirit there’s also going to be a lot of ‘flesh’ and can come to terms with that – no, rejoice in it. It’s been wonderful that there have been so many people who have known about Hannah’s back problems, and are rejoicing with those who rejoice over its healing, and thanking God (by the way the girls went to pray for people at the Leatherhead theatre last night and I’m told it was amazing time!). I’ve also had one or two e-mails via the blog which I ended up spamming because they were from sources I didn’t recognise, and when I looked at the content of the sites they linked to, they seemed to have already made their minds up that this is not of God but has to be of the devil. A tattooed bloke who shakes and shouts? People crying and laughing and carrying on? All too weird – certainly not from God. They have never been, they’ve never seen, they’ve never sensed the presence and power of God there, but they know it’s wrong; illegitimate – of the devil. This morning I was reading with my men’s group out of John 9. You know what comes before that? The end of John 8. Read it and you’ll see that some ascribed to Jesus and his miracles both illegitimacy and evil origin. (Verse 48 is particularly nice!). 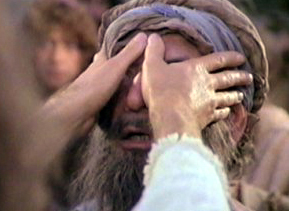 In John 9 Jesus comes across the man born blind. His disciples spend time theologising about his suffering and its origin. They debate the human condition, bewail the sins that cause it. Their question? “Who sinned?” All they don’t do, is anything that helps. I’m not saying we shouldn’t weigh the source, but if you’re asking, who sinned – the answer is… EVERYONE. Todd Bentley, Paul Cain, me, you. If you look online you’ll find some evidence and lots of accusation about anyone and everyone involved (by the way, still reading that biography of Whitefield, a fantastic preacher and a wonderful godly man now so often hailed and lauded. Boy did he take some stick!). I’m not so naive to imagine some of the accusations against Bentley et al. are correct. But Jesus was pretty clear it’s not just people who live in glass houses who shouldn’t throw stones (in fact, if you lived in a glass house, where would you shower?). I for one wouldn’t want all my sins paraded on-line, and people spending their lives looking for things wrong with me would find plenty of material, but I thought the devil was the accuser? (PS I just got the following comment, which I’m not approving, to show the love that abounds here from a brother or sister…) You vile deceiving heretics and enemies of the gospel when will you repent and face reality and the true gospel of Christ and His sound doctrines the HOLY BIBLE. You filthy enemies of God you will pay dearly for supporting your fellow tools of Satan who lead others into doctrines of devils so they may blaspheme God and end up in hell along with you if you don’t repent. You filthy vile deceivers you dare call yourself Christian. Sick filthy heretic. Jesus went on to do something, well, pretty weird. It’s almost too embarrassing to think of the Son of God making spit-mud pies! Then he does something degrading! He smears it on the blind man’s eyes – where’s the respect for dignity or decorum there? He even puts some of the responsibility for whether he’s healed or not on the man, by getting him to do something that looks like faith (he has to walk round the place and wash off the mud himself, Jesus didn’t lead him by the hand.). I discussed with the guys this morning whether we thought Jesus did that on purpose. It’s been said, “He offends the mind to reveal the heart.” Was he provoking a reaction to see whether they were more concerned to protect things being done ‘properly’ (even if nothing was done?). It’s entirely possible to have the form of godliness but denying the power thereof – go to a church near you this Sunday to confirm that; or look at the dire stats and predictions published yesterday, much being the consequence of just such a travesty – a church with pomp but no power and presence. Moses said to God, “We’re not going anywhere with out you!” But too often we’re not going anywhere because we’re without Him. The glory days are consigned to a golden age, with people worshipping a (Deist?) God who used to be powerful (he even wrote a good book! ), but now has kind of lost His divine stuff. He wasn’t a man; we’ll ask his parents instead! He wasn’t born blind; he must be a liar! He wasn’t the same man; because that man was blind! He wasn’t a good man; probably a confederate, and who includes the testimony of crazies who say they’ve been healed? I don’t know whether Lakeland’s a revival. I do know from visiting I’ve got my first love for Jesus back and I’m and full of the Holy Spirit to overflow more than I have been for years (obviously a work of the devil?). I don’t know whether some (or all) of the people who get to minister on the platform are ‘sinners.’ I do know many sinners were repentant and trusting Jesus for the first time. So before you send me a link to your website explaining why the devil’s behind it all, deceiving and deluding – let me ask whether your God still does that kind of thing, today. If not, I’ll stick with mine, thanks. My current position is that when you have seen a million souls won to Christ in your ministry and are consistently seeing the sick healed, then I might listen to your concerns about this revival. To read the blogs, you would think Todd has horns and fangs. I read one that stated his love of Harley’s proves he’s demonic – that and the fact that he listens to CHRISTIAN heavy metal. I was in Lakeland last week and had my life changed. The miracles and stuff were cool, but the presence of JESUS in the meetings was what won me. His presence was so overwhelming and all you could do was love and worship HIM. Todd prayed for me, Denny Cline prayed for me, the girl who had led 1,000 people to the Lord since this began prayed for me, a group of the most amazing teenagers I have ever met prayed for me. I got impartation from everyone and their brother and that is cool, but what I really got was an encounter with the Lord Jesus to take back to my city. By the way, if you are interested, you can read about my experience in Lakeland at rahabsplace.wordpress.com. When the first major outpouring I’d ever encountered hit the UK in the mid 1990’s, I wasn’t personally in a good place with God. I was also a bit freaked by some of the stuff I saw. I couldn’t believe that God was in it. But then, my mum told me in one of the meetings she’d been to (at Stoneleigh Bible Week) a deaf woman (noticeable because she was being signed to) was laughing in the Spirit. Hmmmm, I thought. The clincher was that I saw a girl I knew (but hadn’t seen for a while) who had been going to revival meetings – for want of a better phrase – and to say she was different was an understatement. God had very clearly done something in her. It was the change (or if you want to sound like a Christian, ‘the fruit’) in her life that made it clear to me that I’d dismissed something as being not of God, that totally was of God. When the Jews were looking for the Messiah, most of them missed Him because His appearance and behaviour didn’t meet with their preconceived ideas of what Messiah should be. Do yourself a favour and even if it’s a bit scarey, don’t write off something as not being a work of God. Ask Him to protect you. Ask Him to reveal if His hand is at work in any given situation. Ask Him to help you make any adjustments you need to. Whatever you do, don’t miss out on something that could seriously turbo-boost your relationship with Jesus. Anyways, that’s what I think, for what it’s worth. And hey – I totally loved reading Anthony’s blog. It’s full of great stuff in my opinion. Nice one, Anthony!